On the 17th (Mon), find something for the whole family at Santa Claus Village, see Santa Claus Office, and then find something for the whole family at SantaPark - the Home Cavern of Santa Claus. For reviews, traveler tips, maps, and other tourist information, read our Rovaniemi online day trip planner . Dublin, Ireland to Rovaniemi is an approximately 8.5-hour flight. You can also take a bus; or do a combination of bus, car, ferry, and train. The time zone changes from Greenwich Mean Time to Eastern European Time, which is usually a 2 hour difference. Plan for much colder temperatures traveling from Dublin in December, with highs in Rovaniemi at -6°C and lows at -13°C. Wrap up your sightseeing on the 17th (Mon) early enough to drive to Inari. On the 18th (Tue), get great views at Otsamo Fell, see the interesting displays at Siida, and then take in the architecture and atmosphere at Pielpajarvi Wilderness Church. To see other places to visit, ratings, maps, and more tourist information, read our Inari trip itinerary maker tool . Getting from Rovaniemi to Inari by car takes about 4 hours. Other options: take a bus; or do a combination of flight and shuttle. 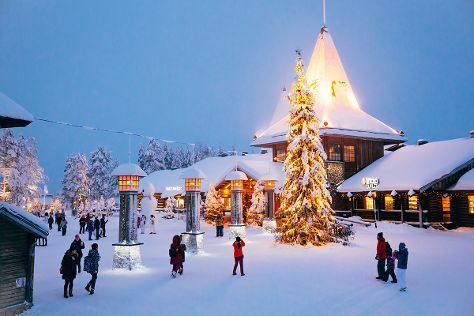 Traveling from Rovaniemi in December, Inari is slightly colder at night with lows of -17°C. Finish up your sightseeing early on the 18th (Tue) so you can travel to Tampere. Kick off your visit on the 19th (Wed): kick back and relax at Rauhaniemi Beach, then relax and rejuvenate at some of the top local wellness centers, and then take in panoramic vistas at Pyynikki Park and Observation Tower. For reviews, photos, ratings, and tourist information, use the Tampere road trip planning site . You can do a combination of shuttle, flight, and train from Inari to Tampere in 5.5 hours. Alternatively, you can do a combination of shuttle, bus, and flight; or drive. Plan for somewhat warmer temperatures traveling from Inari in December, with highs in Tampere at 0°C and lows at -6°C. Wrap up your sightseeing on the 19th (Wed) to allow time to take a train to Helsinki. On the 20th (Thu), learn about all things military at Sea Fortress Suomenlinna, then kick back and relax at Aurinkolahti Beach, and then relax and rejuvenate at some of the top local wellness centers. Here are some ideas for day two: admire the striking features of Rock Church, then stroll through Hietaranta Beach, then pause for some serene contemplation at Helsinki Cathedral, and finally wander the streets of Katajanokka. To see where to stay, more things to do, photos, and other tourist information, refer to the Helsinki driving holiday planner. You can take a train from Tampere to Helsinki in 2 hours. Other options are to drive; or fly. Traveling from Tampere in December, you will find days in Helsinki are a bit warmer (3°C), and nights are about the same (-3°C). Finish your sightseeing early on the 21st (Fri) to allow enough time to travel back home.